Our Vespa tour of modern-day Ho Chi Minh City (Saigon) will give you a view of Saigon unlike anything you'll see from a package tour, and much more of the city than you could see on your own. Your drivers & guide are longtime residents of Saigon, and know exactly how to take in the must-see landmarks while also getting you off the crowded tourist trail for a peek at the history, the streets and the sights that most visitors never even hear about or see. Guests ride pillion behind the drivers. Today, we will enjoy a fun tour on a Vespa motorbike, ride with your driver on a Vespa to explore Saigon's historic landmarks including the 1880's General Post Office and the late 19th century Notre Dame cathedral, both designed by Gustav Eiffel and located in a peaceful part of the city. Next visit is the former Presidential Palace which was once headquarters for the Saigon Government during the "American War". Then we head to the Chinese District of Cho Lon to enjoy the bustling wholesale quarter of Saigon. We pass by Thich Quang Duc Memorial (Thich Quang Duc, who burned himself to death at a busy Saigon intersection on June 11, 1963 to protest against the South Vietnamese regime’s oppression of Buddhists during the Vietnam war), Ho Thi Ky flower market (Saigon wholesale flower market), Chinese Community Temple, streets of Chinese & Vietnamese herbal medicine business and the BinhTay market. Afterward, your Vespa driver will take you to an open door beer shop in busy area of tourists where you can seat along sidewalk in front of the shop to taste a glass of local beer and see people pass by. Following, our van will take you back hotel for freshen up and relaxation. 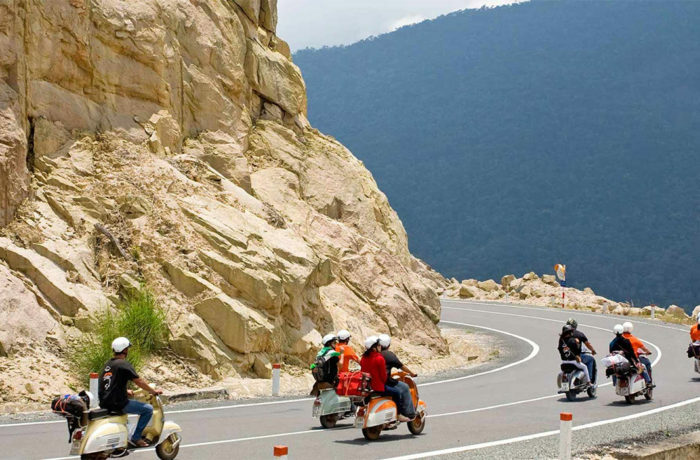 THIS EXCURSION IS BUILT-INTO YOUR VIETNAM HOLIDAY AND WILL REFLECT IN THE TOTAL PACKAGE PRICE.